While many people have likely heard the term “biobanking,” they likely have little to no idea what it actually means. Biobanks often come up in discussions of new studies or research findings, but there isn’t much information on what they are. Biobanks are facilities located nationwide, which focus on various kinds of research. They boasted an impressive 300 million tissue samples at the turn of the century, and that number has grown exponentially since then. Sample tracking provides an easy way to catalog samples based on age, race, and gender, among many other divisions. Funding for these facilities comes from a variety of sources, including fees for services (11%) and funding from individuals or foundations (10%). However, an estimated 36% of biobanks cite the government as their largest source of funding, and they have provided at least some funding to about 57% of biobanks. Though their research is often overlooked by many, we have broken down some of the types of research these amazing facilities do in order to give you an idea of their impact. 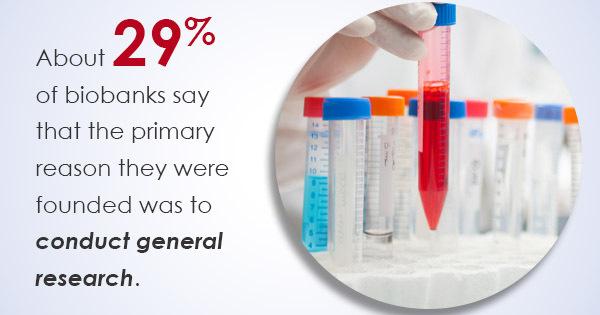 About 29% of biobanks say that the primary reason they were founded was to conduct general research. They look at many different diseases and health issues in order to find creative solutions. Though it is unspecified research, numerous discoveries have been made at the facilities doing general study. Over half of biobanks asked say that they were established for research on a particular disease or issue. For example, many biobanks focus specifically on cancer research. Biobanking software allows researchers to separate samples based on a number of characteristics, and allows them to look at hundreds of samples at a time. This means that scientists can see similarities and differences in the genetic code of the samples so that they can try to pinpoint where cancer manifests exactly. Biobank software is not just limited to disease control and research. It can also be used for environmental research. This research is often used to aid the research mentioned above, as scientists now know that the environment surrounding a patient, whether it be internal (stress) or external (pollution), can significantly contribute to whether a person develops a disease or health issue. Biobanks do so much amazing work, and their discoveries have given us a better understanding of how disease manifests. If this work continues as it has, we may soon see steps to bigger cures.